And ultimately: idea of the downright weird things that can be found here! 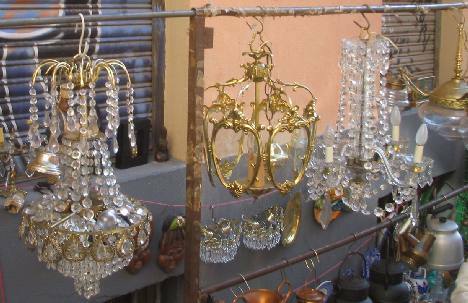 If you haven´t already done so we strongly recomend you read the article on visiting El Rastro when you´ve finished browsing here. 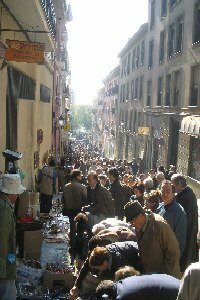 After stepping out of the metro and entering Madrids largest sunday morning market one is always taken aback by the sheer number of people shopping within the narrow streets of what is old Madrid, the barrio La Latina. The following two photos of El Rastro show exactly how the street is barely visible beneath the Madrileños. 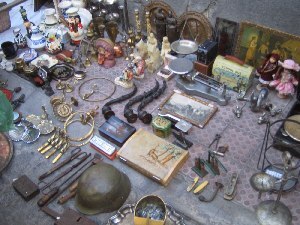 As can be seen from this market stall (laid out on the pavement as its only traders that use tables or fixed stalls) the variety of items available is at best summed up as "eclectic". Alongside the pipes, porcelain and portraits there is a Spanish civil war steel helmet. 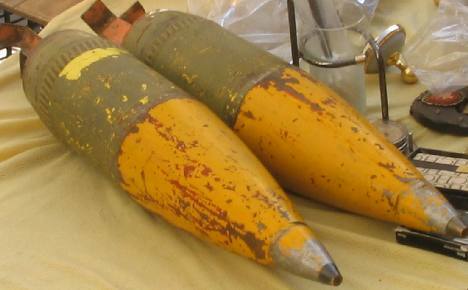 Although it has the same design as German WW2 helmets it is a Spanish made copy from Franco´s time. 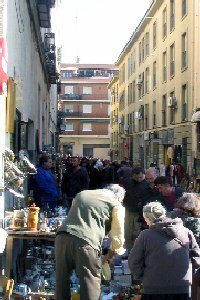 As this El Rastro photo shows it is even possible to pick up souvenirs within the market instead of the tourist shops. You´ll also have the memory of a day out to go with the piece you purchased! "Do they really sell that?" Well, yes they do! Speaking in very broad terms Spanish people do not consume and throw away as much as other countries. This mentality may well be due to the post civil way famine that ravaged the country when everything was scarce and recycled as much as possible. 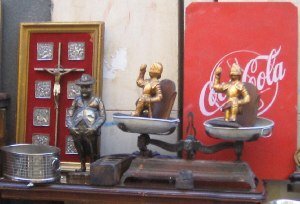 However, for the visitor to Madrid this means there are some unique items on sale in El rastro that make waking up early on the Sunday morning all worthwhile! Prior to purchasing either of these!! !